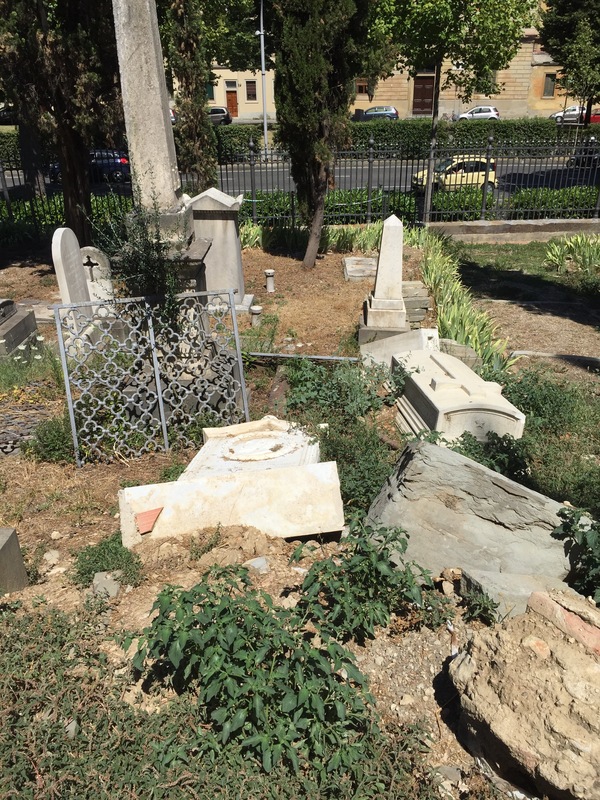 I went up to the English Cemetery on Piazzale Donatello this afternoon to look at the tombstone of Theodore Parker. It’s a bit of a misnomer, Cimitero Inglese, as it’s really a graveyard for Swiss Protestants. But it is the final resting place of numerous Anglo-American ex-pats, like Robert and Elizabeth Barrett Browning, Henry Adams, Margaret Fuller, and the person I was looking for, Theodore Parker. Although I now live in the South, I grew up in Boston. 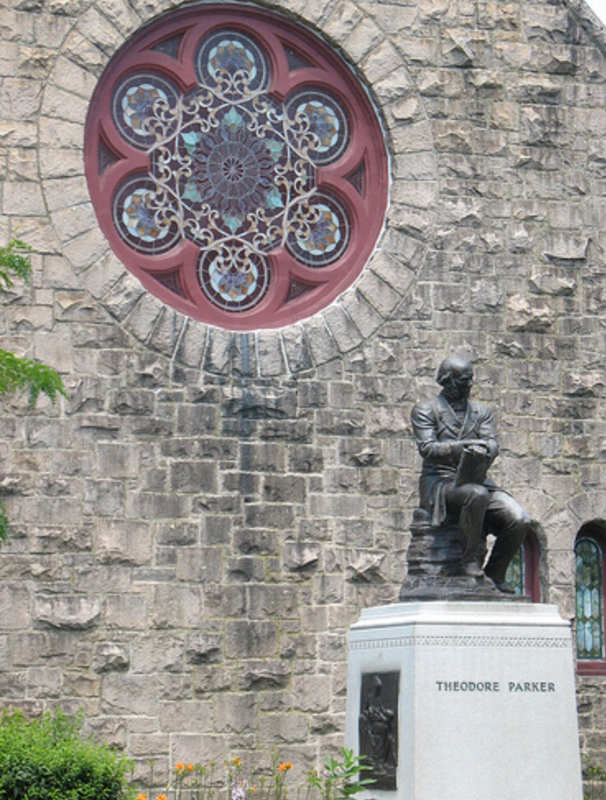 In fact ,the neighborhood I come from was West Roxbury, where, right in the middle of town, is a statue of Theodore Parker, in front of the Unitarian Church where he preached for many years. He is seated, holding the Bible, and has been looking out on Centre Street since the statue’s erection in 1902. His visage was one I saw nearly every day for my whole youth. There was a bus-stop I got off at right in front of Parker, and my dentist’s office was across from the church. For most of my youth, the statue was covered in verdigris, but at a certain point it was cleaned up and made presentable. Among everyone I knew in West Roxbury, Parker was a great unknown. 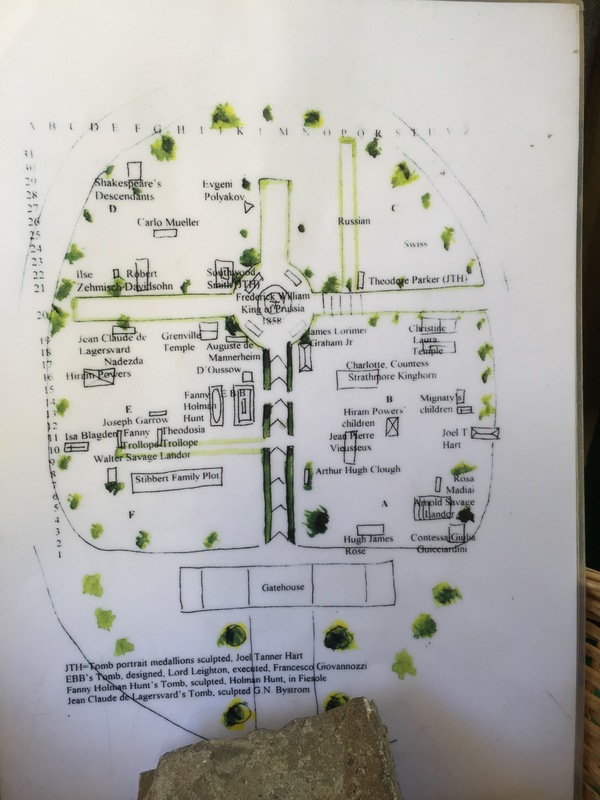 Tha tells you a lot about the characer of the neighborhood, which had become largely Catholic as the 20th century progressed–we knew nothing about the large stone Protestant churches in the vicinity. Still, Parker’s name is not so well known in our time, which is too bad because in his own day, he was a giant. A forceful opponent of slavery, he preached fiery sermons that electrified the abolitionist movement. Parker’s way with words influenced both the Gettysburg Address (it was Parker who has coined the phrase “of the people, by the people, and for the people”) as well as Martin Luther King, Jr. (again, Parker first said, “I do not pretend to understand the moral universe; the arc is a long one, … And from what I see I am sure it bends towards justice”). Parker’s career was a rocky one, given his principles, and his family life was not so placid either. In 1859, he left for Italy to recuperate with his friends, the Brownings, but developed tuberculosis after a short time and died in Florence. Of his death and burial, New York Times (September 5, 1860) noted that a “simple, but tasteful monument had been put up at the grave,” which would later be replaced with a finer one by William Wetmore Story, one featuring Parker’s profile with a beard–very jarring to me, who knew his clean-shaven face from the West Roxbury statue. 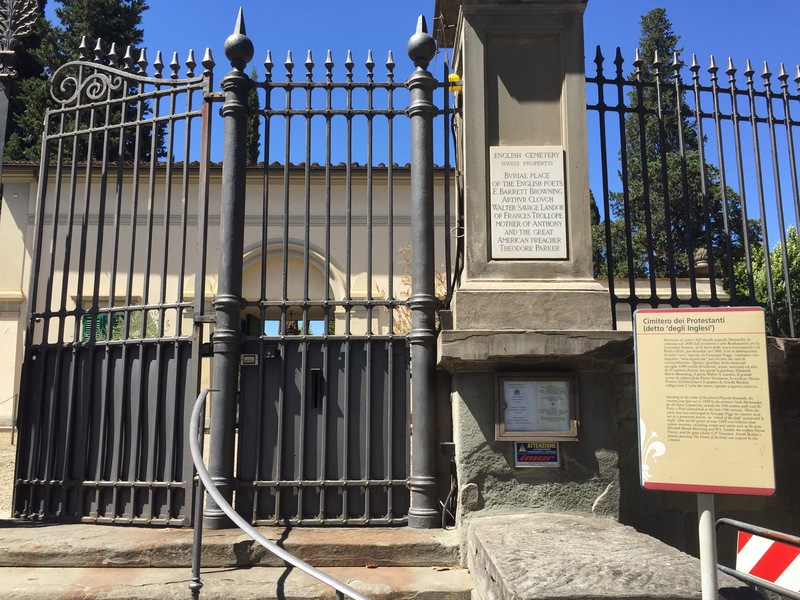 I thought, while I was in Florence, I should go and have a look at his tomb, if only to pay homage to a great man who did so much to make our own age a little more just. So, earlier today, just after spending time at the Museo Archeologico, over to Piazzale Donatello I went. The main-door of the cemetery was slightly ajar, so I let myself in. 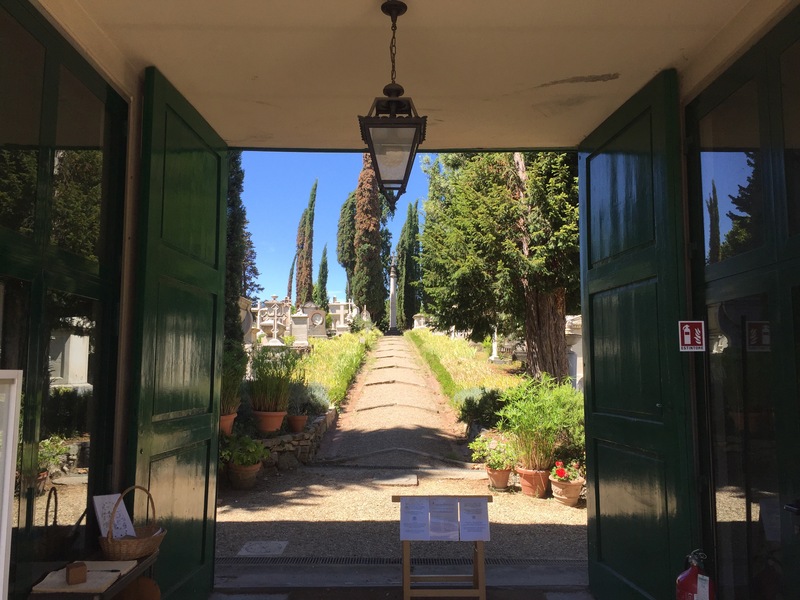 In fact, there is a pretty good website kept for the Cimitero Inglese by another Anglo-American ex-pat, Julia Bolton Holloway, so Parker’s grave was not hard to find. What I found, however, was really quite shocking. As you can see, Parker’s stone has fallen over and looks to have broken at the base. The area all around it is overgrown and disheveled. 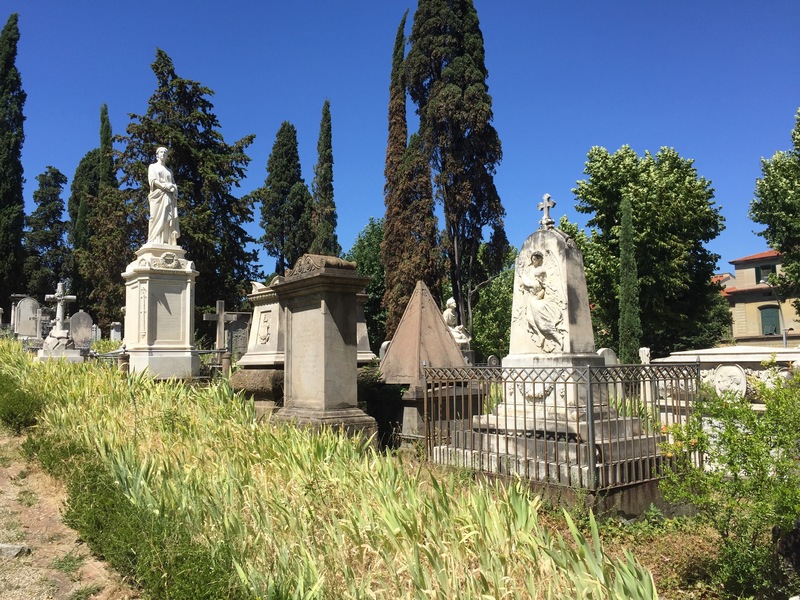 I suppose none of this should bother me– didn’t I spend the whole afternoon trolling around among Etruscan sepulchres and grave goods all displaced from their final resting places?– but somehow it does. Parker was a great man, a true and unfaltering voice for human liberty. 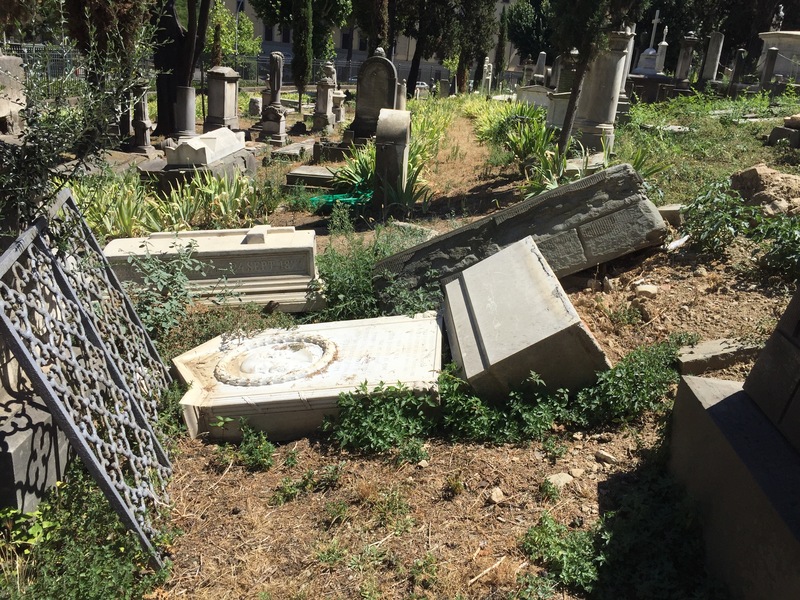 The cemetery is maintained privately, and clearly does not have the funds for maintenance of one of the most important monuments it houses. I have written to Dr. Holloway, and hope to hear back from her. Perhaps I should contact the Unitarian Church, or the West Roxbury Historical Society. People i know in Sewanee have restored stones in old graveyards before, and perhaps will have thoughts. I guess I’m just not ready for it to be a ruin. I’m a member of the Theodore Parker Unitarian Church in West Roxbury and have been teaching a course on Unitarian history there with a retired minister friend. We often use words from Parker to open and close our services. 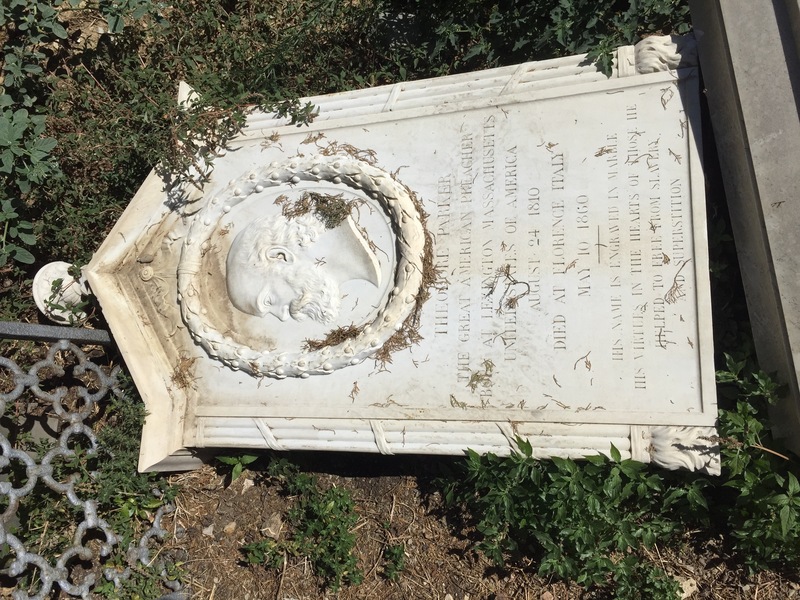 I think we might be able to try to get his grave better maintained. Rev. Parker’s mother was Hannah Stearns, a descendant of Charles and Rebecca Gibson Stearns. Rebecca was a daughter of John Gibson b. 1601. See York College Prof. Thomas Knowlton Gibson webpage. Prof Gibson is aka ‘The Mayflower Man.” The Mayflower Society is located in Edward Winslow old homestead in Plymouth, Massachusetts. It was a childhood home of Amelia Lee Jackson, niece of Mrs Ralph Waldo Emerson. Rev Theodore Parker’s wife Lydia Dodge Cabot was a first cousin of Amelia, who married Oliver Wendell Holmes Sr.